Now we'll consider another hurdle posed by the 10x passive probe's makeup. Namely, what about the issue of cable reflections? Most 10x passive probes have a 36-inch run of coaxial cable between the probe itself and the connector to the oscilloscope. Referring to Figure 1, we find a high 9-MΩ impedance with a 10-pF bypass capacitor in parallel at the probe end, and a 1-MΩ impedance at the oscilloscope termination. By rights, one would expect reflections in that coaxial cable, especially given that we're looking at signals that could be in the 200-400 MHz range. 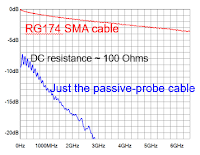 The secret sauce in the 10x passive probe, however, is that the coax isn't your garden-variety coax. 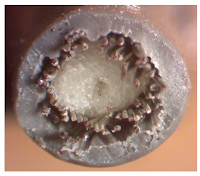 If you cut the cable used in Teledyne LeCroy's 10x passive probes and look at the cross section, you'll see what's shown in Figure 2. The exterior jacket surrounds the braided shielding and insulating dielectric. In the very center is the center conductor made of NiCr wire. The dielectric is a foamed polyethylene with a very low dielectric constant that's close to that of air. At a diameter of 2-3 mils, the NiCr center conductor is highly resistive. The cable constitutes a distributed termination system. It's not a particularly high-performance coaxial cable; in fact, it's very lossy. 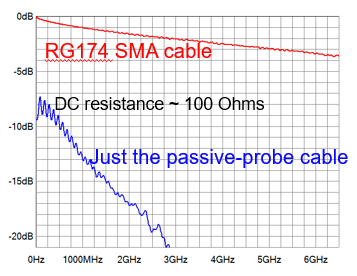 If you take a 3-ft length of the probe cable and a 3-ft length of standard RG-174 SMA coaxial cable and measure their respective insertion losses on a network analyzer, you find that the RG-174 has relatively low losses compared to that of the probe cable, which is highly attenuating (Figure 3). That high level of attenuation is why the probe assembly doesn't suffer cable-reflection issues. High-frequency signals will indeed reflect but in the process, they encounter so much attenuation that they simply don't register as reflected signals. All of the high-frequency components are effectively damped down in the cable, which, of course, is why we're limited to around 400-500 MHz bandwidth through the cable. In our next post, we'll summarize the 10x passive probe and also look at a way to get higher bandwidth and high impedance as well.